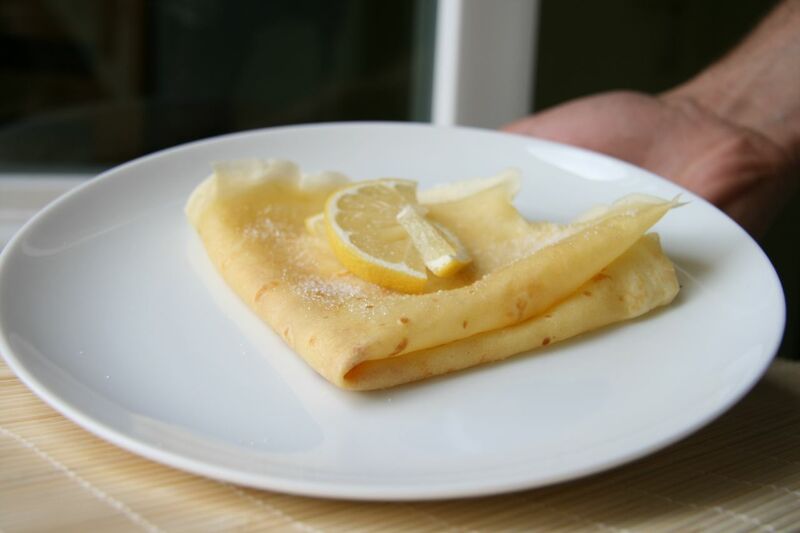 Crêpes, one of the quintessential and classic French dishes. I have no doubt that if you asked 100 people on the street to list a French dish, crêpes would be in the top 5. And, after my 3 months in France, I can see why. My town here in France has many crêperies. These are quaint little restaurants, tucked into small spaces on side streets, that feature crêpe as their main menu items. They sometimes have salads on the menu too, but for the most part, they have just crêpes. They do however, feature two types of crêpes – traditional and galettes. What is the difference you ask? Traditional crêpes are made using a basic flour and egg mixture (like my recipe below!) and are generally topped with sweet filings/toppings. Galettes are made with buckwheat flour and are generally topped/filled with savoury fillings. I generally don’t like sweet things, but here in France, I realized that I like crêpes, but they have to be done right (i.e. not too sweet). Galettes aren’t for me, I am not a fan of the buckwheat flour/texture. CH and I argue about what the perfect crêpe is. He likes his slightly thicker with a mountain of Nutella on-top. 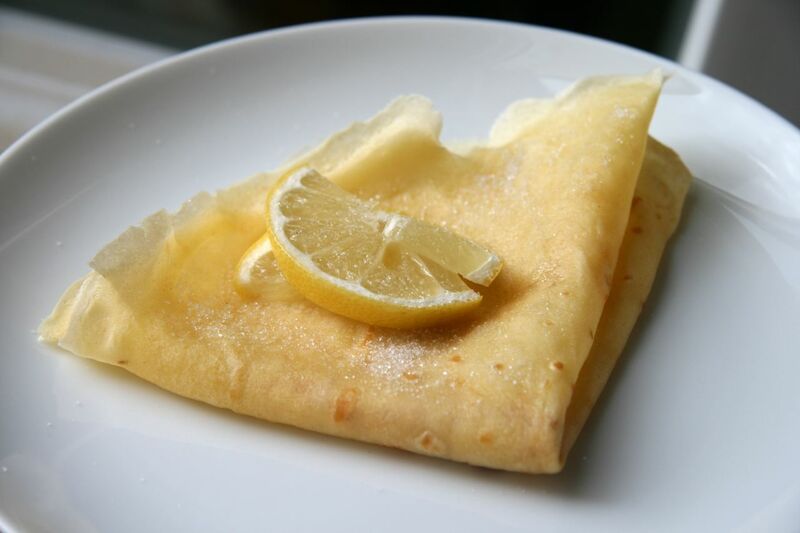 I like my crêpes paper thin, slightly crispy edges, sprinkled lightly with sugar and a squeeze of lemon juice. Plain and simple. However, as the recipe below illustrates, crêpes are so versatile, so you can easily please everyone in your household, with just one batch. They would even be fun to do for a dinner party dessert and have a toppings bar. One thing I should also clarify, is that the French do not eat crêpes or galettes for breakfast. They are generally eaten at lunch time, as a snack or for dessert. However, as CH and I found out, the make for the perfect Sunday brunch item – just be prepared to spend a little more time in the kitchen as they take a while to cook individually. CH and I embraced this and spent literally 3 hours making crêpes a few Sundays ago. I was in charge of cooking them, I’d pass them to CH who would top them, and then we would immediately devour it, while the next one cooked. It was a really fun morning in the kitchen, and quite tasty too! Do you need a special frying pan to make crêpes? I’m not sure. I went out and bought a 6 euro crêpe pan from a local kitchen store and it worked beautifully. When I am back in Canada, I will test out a normal non-stick pan and report back. I hope for those who don’t have a crepe pan, and those who don’t want to buy one, that you can make them without one. To conclude, crêpes have the reputation of being hard to make, however I can attest that they are NOT. All you need is a good basic recipe (below!) and plenty of time and patience (and imitating Julia Child’s accent while preparing them also adds to the ambiance!). Also, don’t forget to plan ahead a little, the batter needs to rest for a minimum of 1 hour. Place the flour in a large bowl. Make a well in the center with your fingers. Place the eggs, milk, sugar and salt into the well. Using a whisk, gradually draw the flour into the center, trying to prevent any lumps from forming. Continue to gradually draw in the flour, until the mixture is well incorporate and smooth. Add the melted butter to the batter, and whisk well to combine and smooth-out the batter. At this point, there should be no lumps and it should be a slightly thick batter (think pancake batter – you will thin it out below). Cover the mixture with saran wrap and set-aside on your counter for 1 – 2 hours, to allow the mixture to rest. Meanwhile, zest & juice your lemons and set-aside. When the batter is ready, prepare your station by placing your bowl of batter, your spatula, icing wand, oil & pastry brush, and clean plate beside your stove. You want everything handy. Thin out your crêpe batter by adding warm water, bit by bit. You want your batter to be the consistency of a light cream, so it should just coat the back of a spoon, but no thicker. Begin by heating your pan over medium-high heat (around setting 8). Grease the pan with vegetable oil, if using. Using a measuring cup, pour about 1/3 cup of batter into your hot pan and immediately tip the pan around in all directions to cover the bottom of the pan. If you have too much batter, pour it off – you want the crêpes to be paper-thin. Using your spatula/icing wand, gently skim the surface of the crêpe to even out the batter. When the outside edges are brown (~ 2 minutes), flip the crêpe GENTLY and cook on the other side for 1 – 2 minutes. Remove the crêpe from the pan and immediately top with a sprinkle of sugar, lemon zest and lemon juice (if you want the extra tang). Fold the crêpe as the picture above shows, or roll it. Serve and devour immediately. Repeat with remaining batter. Don’t forget to grease the pan between each crêpe. Hello, I am back! I am so sorry for the lack of posts lately. CH arrived back in France on a Wednesday night and two days later, my parents came to visit us for 2 weeks. Needless to say, we have been busy but we had an absolutely amazing time with my parents, shared many great meals, many bottles of wine and lots of laughs. I made these lettuce wraps a few weeks ago, when France was experiencing a slight heat wave. I wanted a light, easy to make meal that didn’t involve a lot of cooking time. I had been craving lettuce wraps and I don’t know why. A restaurant in Vancouver makes the most amazing Asian lettuce wraps, but since I am a few months away from having those, I figured I would make my own version. Although totally different, these lettuce wraps did not disappoint (and I might admit that I liked them better). I actually ate these for 3 days in a row (I still cannot master cooking for just me! ), but I didn’t mind because they were so good and a perfect summer meal – I even took them down to the river with a glass of wine one night. The black beans add a lot of depth and substance to an otherwise low-calorie meal, but they do not take away from the fresh & crunchy texture all of the vegetables and mango. I made my salsa based off of this Pink Parsley recipe and then added in my own twist, with extra vegetables and of course, the black beans. I topped off the lettuce wraps with a touch of crème fraîche (substitute sour cream) and a few springs of cilantro and they were perfect. Now that CH is back in France, I will have to make these again because I know he will love them. Anyways, if you are looking for a new summer recipe, this is it. As I said above, it makes for a great picnic item as they are easy to transport and stay fresh for quite a while (as long as you don’t assemble until you are ready to eat). My only warning – do not make or eat these on a first date or during any type of event that you are trying to impress someone. They are incredibly messy to eat, so make sure you have a few napkins handy and maybe an ice cold beer nearby to wash them down! The night before you make this recipe, soak your black beans in cold water (read this site for more information about soaking/cooking dried beans – Link Here). Be sure to rinse the beans and discard the soaking water before proceeding. The next day, place your beans, garlic, cumin and chili powder in a medium sized saucepan and cover with cold water (you want the water to be about an inch above the beans). Bring the beans to a boil over medium-high high. Once they have reached the boiling point, turn them down to a simmer and cover. Cook the beans for 45 minutes – 1 hr. Your cooking time with depend on the size of your bean, the age and the freshness. You will know they are cooked when you can mash them together with a fork or your fingers. Remove the cooked beans from the pot & drain. Place in a bowl and allow the beans to cool. (Recipe Note: You can also use canned black beans and add them directly into the mango salsa recipe below – just be sure to drain & rinse them thoroughly. Although I have not tried it yet, I am confident it would work well without affecting the overall flavour of the dish). Prepare your salsa by dicing and placing all of the ingredients in a large bowl. Add in the lime juice, olive oil and season to your liking with S&P. Once the black beans have cooled to room temperature, add them to the salsa and mix well. Place the mango & black bean salsa mixture in the fridge and allow it to rest for 1hr (this will allow the flavours to meld together and for the black beans to cool and absorb some of the additional flavour). 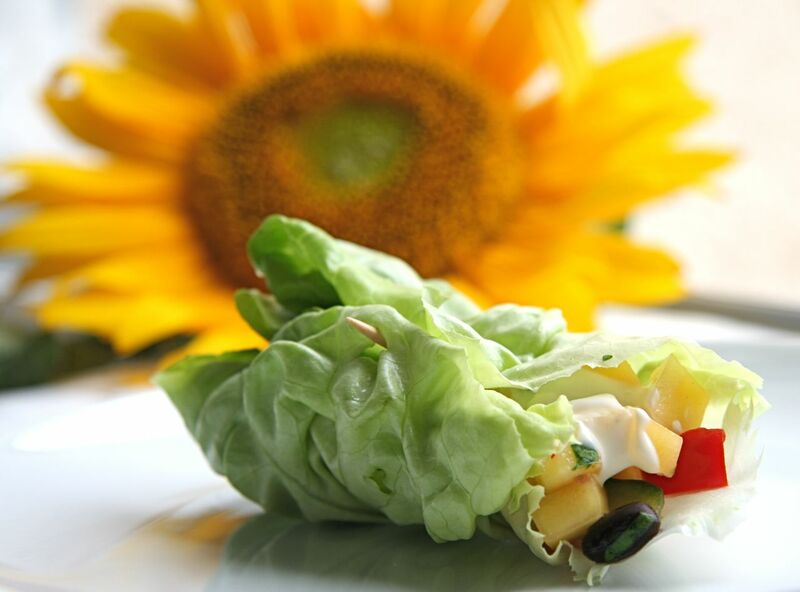 When you are ready to serve, take one of the washed lettuce leaves and lay it flat. 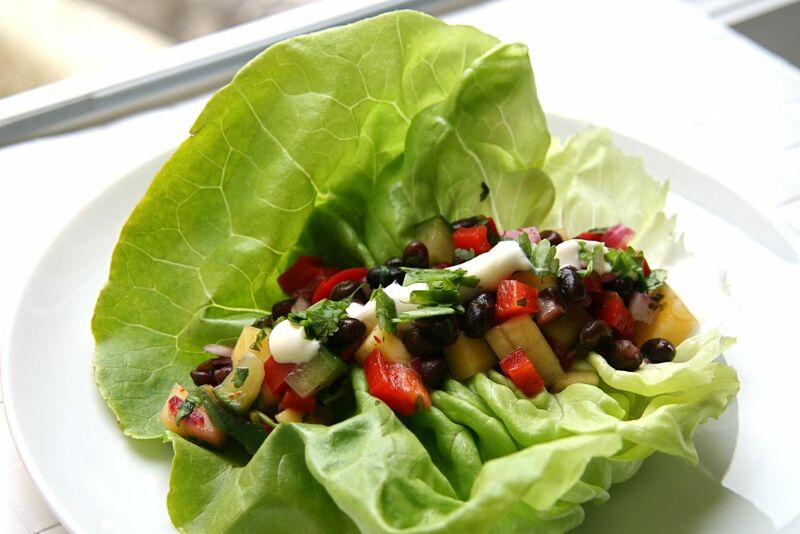 Add a few spoonfuls of the mango salsa and black beans, a dollop of sour cream and sprinkle with cilantro. Fold the soft side of the lettuce (I call it the top of the lettuce leaf) towards the mixture and roll the lettuce leaf into a cigar shape. Devour immediately & repeat with remaining ingredients. One of the things I love the most about traveling (and now living) in a new country is the exposure to new foods. While France is fairly similar to Canada, I have had the opportunity to try some new foods such as rillettes (similar to a pâté), Sainte-Maure goat cheese (the regional specialty), escargots (which aren’t uncommon in fine dining restaurants in Canada, but here they are the norm) and of course, I have come to love the artistry breads, pastries and sweets. As I’ve stated many times before, I love going to the market here. For the most part, I enjoy learning the French names for some of my favourite vegetables, but from time to time I see something that I don’t immediately recognize. White asparagus was one of them. I’m not sure if I just walked by it at our stores in Canada, or if I have simply not seen it before, either way I have been missing out. White Asparagus is amazingly delicious and well worth the slightly expensive price tag. As the website, Asparagus Growing, states: “White asparagus is also called the king of darkness because it grows underground and sometimes it is even referred to as white gold. It is special for how it is produced. It is cultivated by depriving the plants light. The plant is covered with dirt while growing to keep it in the dark. That way the plant cannot produce chlorophyll so the stalks don’t get their green color and remain white […] as a result, the white asparagus is slightly bitter, but tender, fibreless, soft and more delicate than the green one.”. After some recipe research, I found out that white asparagus is usually prepared in a soup or lightly steamed with a lemon garlic sauce. I wasn’t feeling like a cream of asparagus soup or just simply steamed asparagus, I wanted something different. Since I always crave french fries, the idea of coating the asparagus in breadcrumbs entered my thoughts and I decided to go with it. I have to say that this was probably one of the best ideas I’ve had in a while. It was delicious, the crispy outside compliment the tender yet meaty inside, and in my opinion, you really couldn’t ask for more. I absolutely inhaled the dish, vowing to make it again soon. I served this dish with a fresh garlic aioli, but in all honesty it went to waste because this asparagus didn’t need anything alongside it – it was just too perfect by itself. 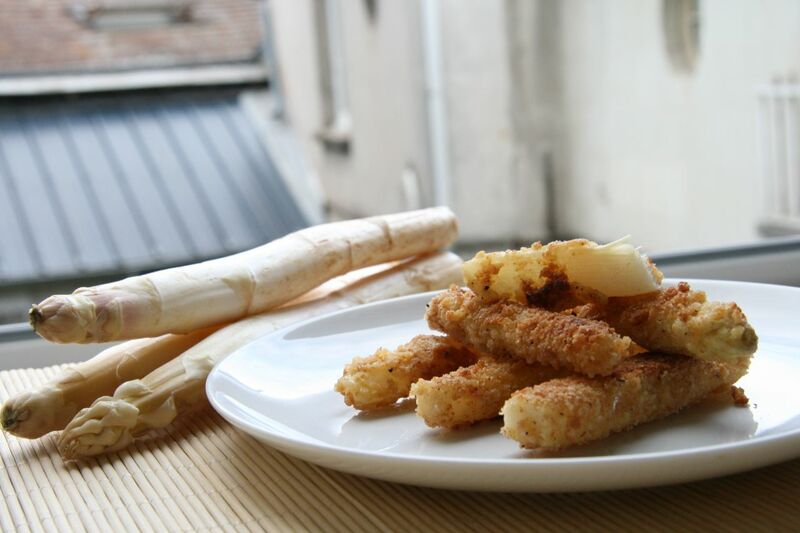 Hopefully you can purchase white asparagus in your region and can give this recipe a try. All I am hoping is that I can find white asparagus when I get back to Canada, that or I will have to plan a return trip to France next Spring to make it again! Bring a large pot of generously salted water to a rolling boil. While waiting for the water to boil, prepare your asparagus. Since the outside skin of white asparagus are tough, you will need to remove it by peeling it with a vegetable grater (or with a knife, with a very steady hand). Trim the bottoms of the asparagus, about 1/2 an inch. Once the water has reached a boil, add in the lemon half and the asparagus. Cook the asparagus for approximately 20 – 30 minutes. White Asparagus is a lot denser than green asparagus, thus it takes a lot longer to cook. You will know it is ready when a knife inserts easily into the middle of a stalk and you can remove it without resistance. Remove the asparagus from the water and place on paper towel to drain. Allow the asparagus to cool to room temperature (about 10 minutes). Once the asparagus is cool, slice the asparagus in half horizontally, creating two stalks about the same size. Now, prepare the coating. In a small bowl, combine the bread crumbs, garlic powder and a generous amount of S&P. In another small bowl, place your slightly beaten egg. Finally in a third bowl, place the flour. Basically you are creating a breading station. Begin by placing 2 or 3 stalks of asparagus in the flour. Toss to coat and tap gently to remove excess flour. Then, dip each stalk individually into the egg mixture and then place it into the breadcrumb mixture. Gently pat the asparagus stalk, to evenly coat it with the breadcrumbs. Remove the asparagus from the breadcrumb mixture and set aside. Repeat the steps until all of the asparagus’ are coated. In a medium sized non-stick frying pan, heat the olive oil and butter over medium-high heat until bubbling. Add the asparagus to the pan and cook for approximately 5 – 7 minutes, checking and rotating frequently to ensure even cooking and a crisp, golden brown on all sides. Remove from the pan and place again on paper towels to drain off excess oil. Serve immediately with a dipping sauce of your choice!